Although parasites harm their hosts, they don’t usually kill them, if only to keep themselves alive. Not so with parasitoids, which ultimately destroy and often consume their hosts. Parasitoid wasps, which inspired the monster in the movie “Alien,” lay their eggs inside their victims, with the offspring eventually devouring their way out. A number of the species control their host’s minds in extraordinary ways — the larvae of the wasp Hymenoepimecis argyraphaga, which infests the spider Plesiometa argyra, makes their victims spin unusual webs especially well-suited for supporting their cocoons. The genus of bacteria known as Wolbachia infests a whopping 70 percent of the world’s invertebrates, and has evolved devious strategies to keep spreading. In female hosts, the germ can hitch a ride to the next generation aboard the mother’s eggs, and since males are essentially useless for the bacteria’s survival, the parasite often eliminates them to increase the rate of females born, by either killing male embryos outright or turning them into females. In a bizarre death sentence, the fungus Ophiocordyceps unilateralis turns carpenter ants into the walking dead. The fungus prefers the undersides of leaves of plants growing on the forest floor. That’s where temperature, humidity and sunlight are ideal for the fungus to grow and reproduce and infect more victims. 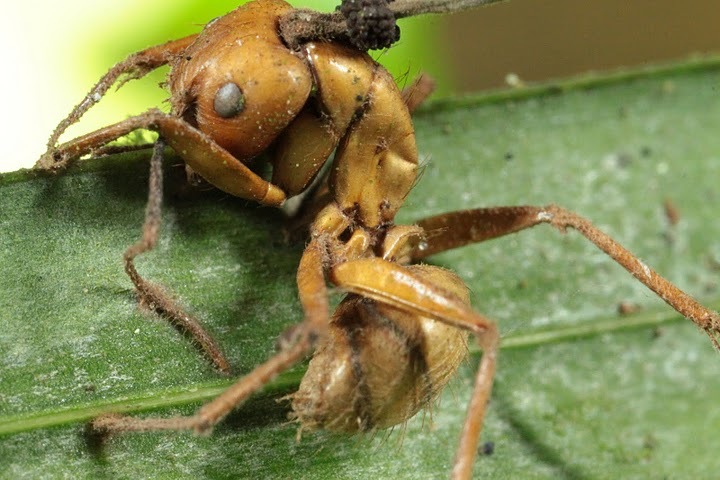 The parasite gets the insects to die hanging upside down, and then erupts a long stalk from their heads with which it sprinkle its spores to other ants. Fossil evidence recently suggested this fungus has zombified ants for millions of years. The crustacean Cymothoa exigua has the dubious and unsettling honor of being the only parasite known to replace an organ. It enters through the gills of the spotted rose snapper, attaching to the base of the fish’s tongue, where it drinks its blood. The bloodsucking causes the tongue to eventually wither away, at which point the crustacean attaches itself to the tongue stub, acting as the fish’s tongue from then on.